Being out and about with a baby usually means at some stage, said baby will need a nap. And that nap will be in a pram or stroller. And if your baby is used to snoozing in a certain environment, you’ll know the joys (insert sarcasm here) of walking around with a grizzly baby. Here’s a brilliant cover, that will fit any pram or stroller, and create a serene sleeping space that includes leg room, and almost complete darkness. Earlier this year we introduced you to the Fly Babee Sleep Easy cover – and espoused its benefits as a brilliant air-travel companion. Because we do love versatility in baby products (and as much as we’d like to, we’re not all jet-setting non-stop), we thought we’d explore how you can use the Fly Babee in everyday life. In essence, the Fly Babee Sleep Easy cover is a pop-up sleep cover, which blocks out 97 per cent of light. So it pretty much creates a cosy cocoon of sleep-inducing darkness. It’s also 100 per cent breathable – ensuring the safety of your slumbering babe. 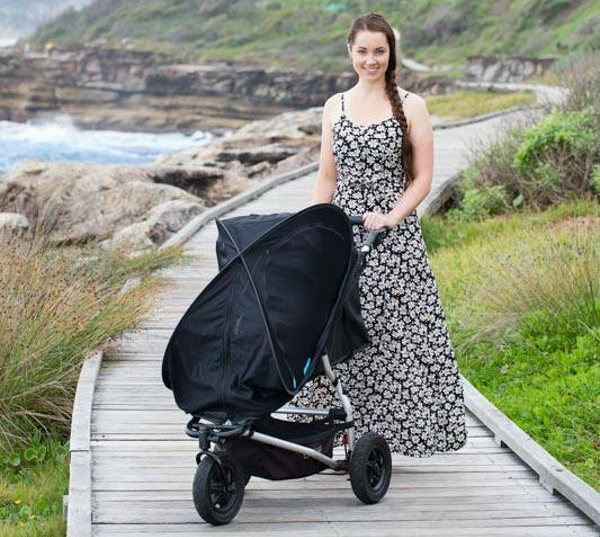 As I mentioned earlier, the Fly Babee fits all stroller and prams – that means if you have a three-wheeler, umbrella stroller or travel stroller, this cover will fit. No exceptions! 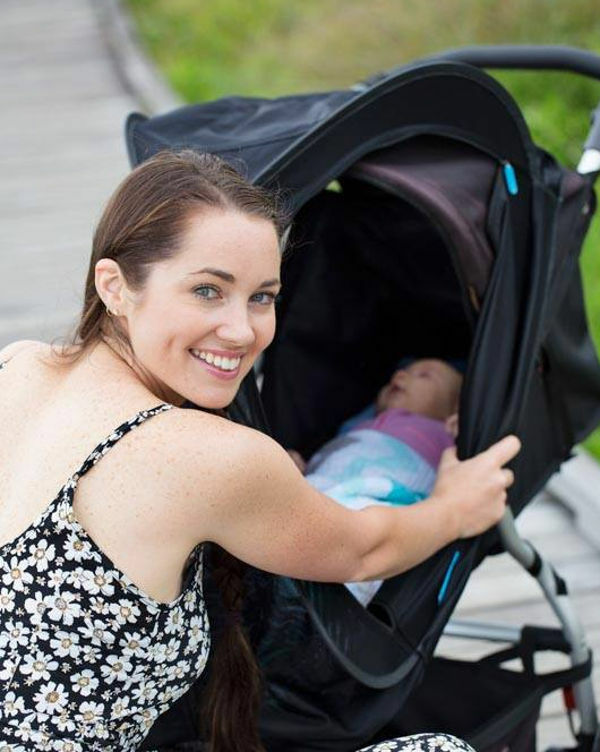 The Fly Babee cover is also really versatile – and of course can be used while baby is awake as sun protection. The front can remain closed while the large open sides provide windows to the world. If the sun changes position, just zip up one or both of the sides to protect your child. When your baby falls asleep, you can zip up all the sections, and create an almost 100 per cent light-free sleeping environment. While it will be dark, baby will still be able to see movement and shapes, so there’s still a comfort-factor. The other nifty thing about the Fly Babee is the bubble shape. This means there’s plenty of room for little legs to kick and get comfortable – and it doesn’t feel enclosed for baby. The shape also means that there’s room for cross-flow ventilation, so even on a warm day, cool breezes can whisper through the cover. While you may think just throwing a blanket or wrap over the pram will suffice when it comes to helping a baby sleep, those of us who have done it know how frustrating it is. The wind is not your friend, nor the wheels of the pram, which usually get entangled with the blanket. The Fly Babee has clips which secure onto both sides of the pram. 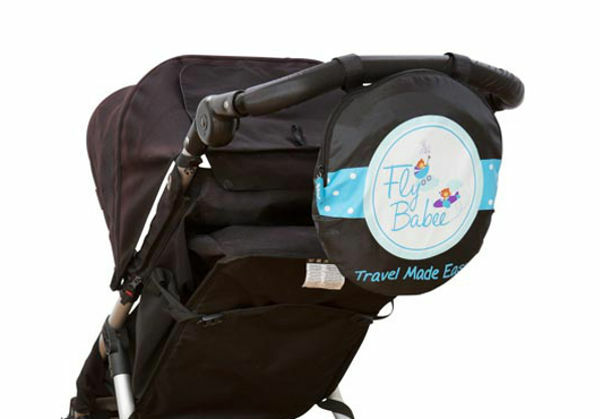 When you’re finished with it, the Fly Babee folds away and is stored compactly in its bag, which attaches to the pram. What’s more, as we’ve previously mentioned, the Fly Babee Sleep Easy cover comes into its own when travelling by plane with babies. 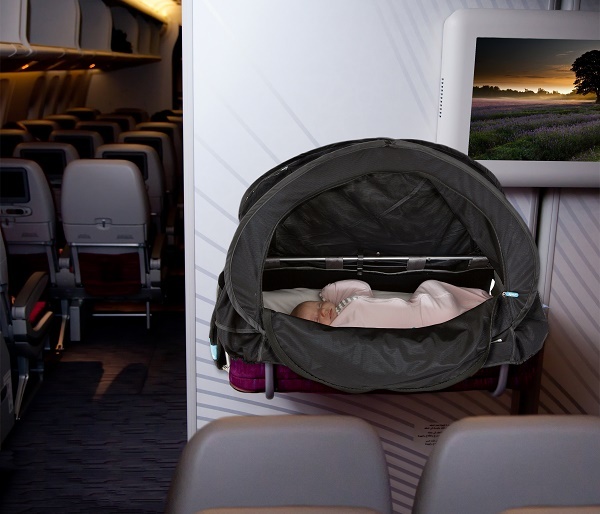 It’s designed to fit airline bassinets, so it will be worth its weight in gold on any flight. Once you reach your destination, it will fit any pram or stroller you may hire or take along with you. It’s the ultimate travel companion for parents!